C. Gilbert, Furniture at Temple Newsam House and Lotherton Hall, Leeds, 1978, p. 287. This wine-cooler has a different history to lot 137, the serving-table from Banks Fee House. 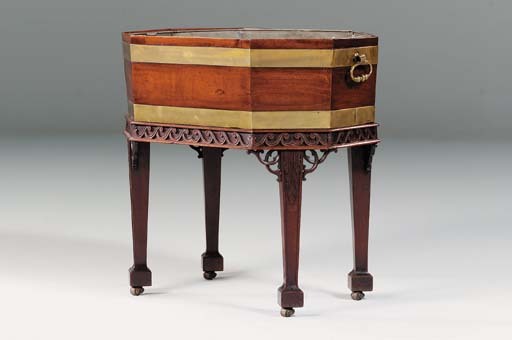 The late Christopher Gilbert suggested that this might be a wine-cooler that had accompanied the Boynton Hall side table, now at Temple Newsam House and referred to in the footnote to lot 137. However, this wine cooler was not in the Boynton Hall house sale in 1959 so this must remain speculative. In the Temple Newsam catalogue (loc. cit.) Christopher Gilbert referred to an old photograph showing the wine cooler beneath the sideboard table at Boynton Hall. He subsequently withdrew the statement that the wine-cooler in the photograph has a lid (unpublished information).